Why did Jesus become a shape-shifter? 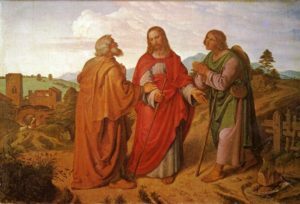 The Revised Common Lectionary’s Gospel reading for April 30 is the story of the two disciples meeting Jesus on the road to Emmaus and listening to Him explain Scripture to them and then joining Him for a meal, never even recognizing Him until He broke the bread. This is one of several high-profile stories in which even people close to Jesus don’t recognize the resurrected Christ. Mary Magdalene, for example, thought He was the gardener when she first saw Him outside His empty tomb. Yet it is part of a pattern in which the risen Lord is less than fully corporeal. For all His followers’ insistence that Jesus returned in the flesh, so obviously as somebody with a living body that they were able to see and feel His wounds, they also describe Him as being utterly unmoored to the ordinary physical world. Not only is He a shape-shifter, able to assume appearances that make Him unrecognizable to His close friends, but he also is a will-o’-the-wisp — entering through locked doors; sometimes in two places so nearly simultaneously that no ordinary person could traverse such large distances in so little time; disappearing repeatedly from their sight as if His appearances were mere phantasmagoria. Of course it is easy to say that a God who can create the whole universe, who can heal cripples and give sight to the blind, and who can raise Himself from the dead, can surely do the comparatively easy trick of alternating between flesh and spirit as it best suits His purposes. Still, one must ask, why does He choose to present Himself in this way, thus confusing the heck out of the very friends and followers He will need to be most sure of Him in order that they are moved to spread His good news far and wide while risking their very lives to do so? My Novel, “Mad Jones, Heretic,” is published! Mad Jones Returns! Trilogy is Now Published!